This celebrity cabin is being offered on three lots totaling 19.22 acres. The parcel the cabin is on is 6.61 acres and is fully fenced. There is privacy fencing on the road frontage. Optional extra acreage of 78 acres to the west brings the total offering to 97 acres. All 97 acres of the property is within Lion Canyon in the Sierra Verde Ranch lying within the bounds of the Double O ranch. Lion Canyon is a picturesque and serene getaway in the most natural setting one can imagine. 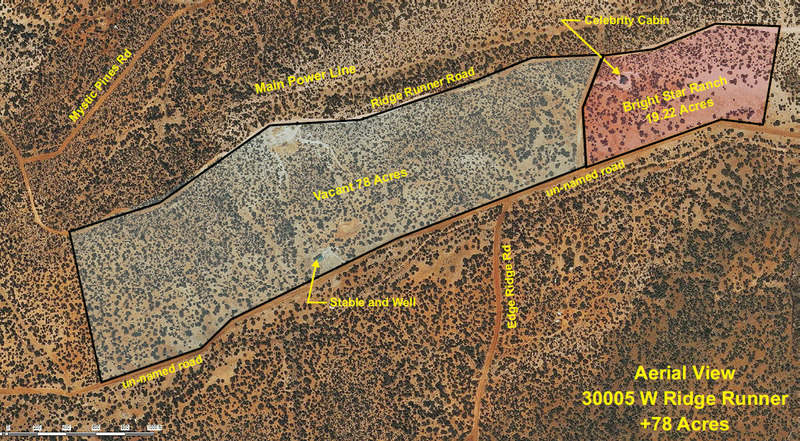 All the properties being offered here are on south-facing slopes running down from Ridge Runner Road to another un-named road at the bottom of Lion Canyon. All the property is open with glorious Juniper and Pinon Pine trees mixed in. The cabin is 12 miles SW of Seligman in Lion Canyon which is located within the bounds of the Double O Ranch in Unit 12 of the Sierra Verde Ranch. The road is a scenic drive across open prairie. Prairie Dog hills dot the open landscape while one may often see wild burros left from Arizona’s mining days. Pronghorn Antelope are often seen here, as are cattle from the Double O Ranch which run on open range and are almost always visible along the drive to the cabin. The beautiful gate leading to the Bright Star Ranch has a remote-controlled solar-powered gate. The gate has a custom iron sign labeling the place as the “Bright Star Ranch.” The driveway is a gravel circular drive and is extended to the rear of the home where the entrance to the kitchen and the main living area is at driveway level. The artisan-made cabinetry is made from custom-milled Alligator Juniper. The counter tops are black granite and the cabinets feature roll-out shelves. The backsplash is natural slate that is highlighted by under-cabinet lighting. The kitchen appliances are all stainless-steel. The sink is equipped with a reverse osmosis system and there is a pass-through window to the wrap-around deck outside. The massive fireplace is stone veneer over a Nandota gas fireplace. It features a flagstone hearth and a custom-milled mantle of rustic Alligator Juniper. The greatroom has vaulted ceilings with exposed beams and ceiling fans to evenly distribute the cool mountain air from the outside. The greatroom has four Arcadia vinyl-clad French doors by Anderson. The door at the main entrance is also a vinyl-clad French door also by Anderson. The doors feature triple-deadbolt technology for enhanced security. There is a lighted, custom-made display cabinet next to the stairs.The trim around this cabinet and all the windows features a “free edge” meaning the edges follow the natural shape of the trees from which they were made. The free edge shows the wood artistry and the natural beauty of the wood that totally pervades the entire home. Inside doors are Knotty Alder, another wood that is well-know for its glorious knot patterns and grain. The master suite has another French door to the outside. Both bathrooms have large pedestal sinks and have Kohler water closets and bathtubs. The bathrooms are both embellished with slate tile. The impressive stairway leading upstairs has a stair stringer made from an Arizona Cypress tree. Other stair components have natural shapes with the stair railings and spindles even showing worm tracks. There is one bedroom, a full bath as well as a loft upstairs. The skylights here and in the great room can be opened for natural ventilation if desired. The wrap-around deck is naturally finished. The columns are made from Juniper Trees salvaged from the building site. The deck railings are custom fitted from iron and each section has an iron oval art accent showing local animals. This cabin is in a very serene and quiet setting and only one other dwelling is visible. Views from the deck show off the picturesque Lion Canyon while the artistry of the builder is shown by the rustic, naturally finished columns, the iron railings and the oval iron sculptures that accent the railings. There are two large flagstone patios both showing off the work of a talented stone mason. The lower patio has a firepit and the upper patio is pre-wired for a hot tub. The xeriscape landscaping features native plants and sandstone rocks with rounded corners with the appearance of river rock. The “owned” propane tank is buried and out of view. There is a very capable central heat and air system. This is one of only a very few few properties in the area with on-the grid electric power and absolutely one of a kind with central heat and central air conditioning. 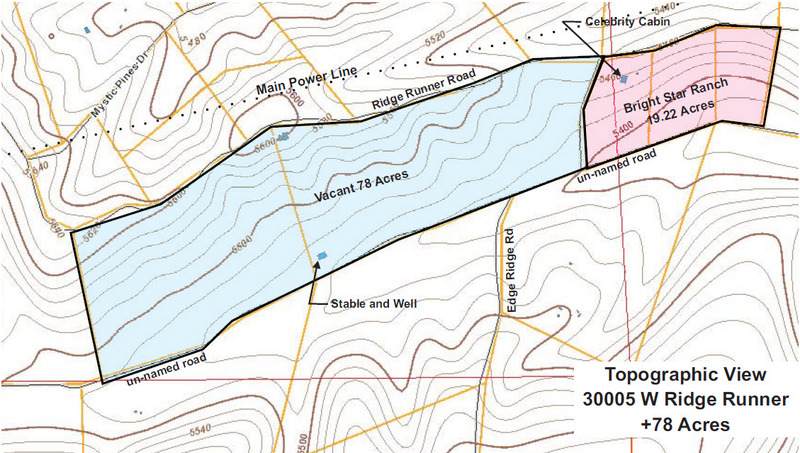 The 78-acre parcel adjoining to the west also slopes downward to the south from Ridge Runner road. This property also has on-the-grid APS power, around 1,100 ft of which runs underground to the stable. The stable is 36′ by 60′ made by Barnmaster and includes four horse stalls, lots of open space and a 3/4 bath. The stable is made entirely of steel with wood exterior siding and a concrete floor. There is also an RV parking space complete with electric and water hook-ups. dump station and a concrete patio. All total there is over 2 miles of road frontage to the 97-acre ranch.